Our Products >> KNOTWORK BAND RINGS >> "Lovers Knot ring, ladies petite 3mm"
Wow! 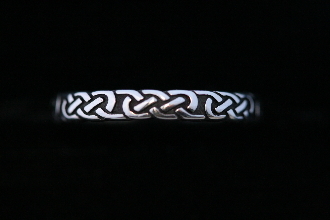 Finally I have developed the technique to create really tight patterns for women desiring a very narrow celtic ring pattern. For years, I have been asked by my guests for a ring to wear alongside other bands etc, or just a very petite narrow band, and now these requests have become reality! Also check out the "lady Lovers band, and matching Mens Lovers knot rings in this Lovers series. "Lovers Knot ring, ladies petite 3mm"